When Nancy Goudarzi closed her gift and garden shop on Freedom Blvd. several years ago, she wanted to spend the time she now had giving back to the community, and she wanted to focus on food. Why food? “Because it’s the most valuable and basic way to help,” she declared. Nancy first looked into helping an organization like Ag Against Hunger with gleaning (gathering grain and produce left behind after harvests). But the heavy lifting would be problematic for her so she looked around more, found Second Harvest, and knew it would be the perfect fit. 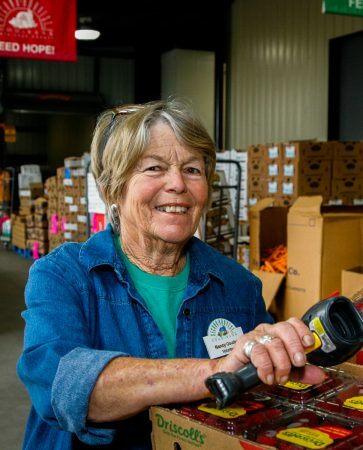 Nancy started out in our sort room, helping to pack produce bags and sorting the food donated by the community. A year later, there was an opening for volunteers in our Agency Distribution Center (ADC), and she has been helping there ever since. Three mornings each week, the ADC is a bustling hive of activity. Forklifts drive pallets of food and produce from the shelves and coolers to the ADC floor, where representatives from 60 of our partner agencies “shop” for food for their programs. These organizations include pantries, soup kitchens, youth programs, residential programs, and more. Just like at a supermarket, the agency reps check out with their shopping before loading up, and that’s where Nancy comes in, scanning the items into our system and ensuring a smooth check-out for our clients. More than this, Nancy develops relationships with the agency representatives and Second Harvest staff, strengthening our effectiveness and working towards a community where no one goes hungry. The food and fresh produce Nancy scans ends up at dozens of sites across Santa Cruz County serving children, the working poor, the homeless, elderly, vets, and others who may be a little short of that most basic of human needs—food.